Many of you would have got these emails copied to you this morning - but for those of you whose email addresses I haven't as yet collected - please read through the correspondence below. It really would be great to have a date that is convenient for as many of us as possible to meet the Olympic Suits. Please leave comments up here to say which dates are more convenient for you, and together we will set a time. If you are unable to make it to the meeting - please leave your questions, suggestions, comments, compliments & grumbles up here as well, and we will pass them on. As usual - this also goes if you are too shy to talk at meetings - put your comment up here - and we'll raise it on your behalf with you listening to the answer straight from the suits mouth. I have just left a voice message on your mobile to let you know that the Operations Director and Project Manager from Skanska would like to meet with you and other residents if possible? (especially those who have complained to you about the noise coming from site out of hours) they have suggested either tomorrow afternoon or Monday morning. Please let me know when a suitable time will be and they will go to Lea Bank Square and meet you at a convenient location. I have just got off the phone with Giorgia Sharpe from the Olympic Community Team. As some of you are all too aware - there is a massive increase in noise & dust from across the canal. Some of it has been 'emergency' work being carried out in the middle of the night (flooding pumping) - but most of it is just sloppiness - vehicles reversing, diggers banging mud out of buckets, contractors not honouring the working hours, generators being left on, trucks beeping horns, etc. 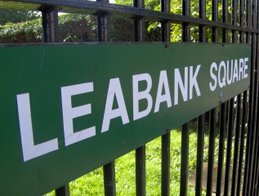 As the Leabank Square Olympic Spy Person - I gather all the complaints from as many residents as possible - and pass them over to the Olympic Community Team. Although - by far the most complaints are about dust - the ones I get out of hours are about these sloppy noisy examples interrupting the sleep of Homerton Hospital & London Transport shift workers. These residents need their sleep to be uninterrupted in order to look after us in hospital, and carry us all over London to work. Please ignore the dates these suits are pushing us to meet - after chatting to a few of the (above) shift workers - the date most popular to meet with them is Monday 10th August (about Mid Day up on the riverbank). Please leave comments up here to either confirm or give an alternative date for the meeting. I know we have by far much more pressing issues to deal with at the moment in Leabank Square - but we haven't discussed the noise & dust for a few weeks now - and this is the ideal opportunity to speak to the suits directly. It was good to talk to you, as per conversation I will wait to hear from you regarding a suitable date & time for the construction team from Skanska to meet with you and residents. Yesterday a fantastic group of adventurers went out into the Wick to discover all the edible delights that are on offer to simply pick and eat. We started off in the Wick woodlands and discovered that we had, on our team, an expert tree climber - Nancy - the perfect person to pick an apple or two! There were lots of apple trees , hazel trees and blackberry bushes in the Wick woodlands - a true dream for anyone looking for free food. Blackberry picking was a breeze as we had Gwen on our side - a previous monkey bar incident provided us with the perfect anti-scratch tool - Gwen's plaster-cast arm! We left the woods with a fantastic hoard of apples, hazelnuts, blackberries and a great bunch of very happy children. Next stop was the Number 26 Bus Stop on Chapman Rd - here we discovered a whole row of plum trees with the sweetest, most delicious plums you'll ever taste this side of the Wick. Luckily for us Sona had the good thinking to bring along a long pole and tin can tool which, along with expert tree climber Nancy meant that we helped ourselves to hundreds of these gorgeous balls of fruit. Thank you to, the two Toms, John, Nancy, Cyprus, Shanthi, Safiri and Gwen for a great day picking fruit in Hackney Wick! The day ended with a hotdog and marshmallow dinner up on Leabank Square River bank for all the great foragers of the day. Thanks to all the residents who planted their free sunflower seeds all those months ago - we have a stunning looking Leabank Square just now!!! The Big Lunch due to take place this Sunday 19th July has been cancelled. This is due to unforseen circumstances. At last weeks Family Mosaic Tenants Association meeting - there were huge crime concerns raised about Leabank Square. This is a reminder that we can bring all these concerns to the Safer Neighbourhood Team meeting this Thursday 16th July - at the Hackney Wick Community Centre - at 7pm. Sergeant Port and his team are begging anyone who has any concerns whatsoever - to bring them along to the meeting. This is the best opportunity to air any niggles & worries about whats going on in Leabank Square & Hackney Wick in general - and get something done about it! Remember - if the Safer Neighbourhood Team don't know about it - they cannot do anything about it! Please come along - it's completely informal - and you'll feel better about getting it all off your chest! Fantastic Leabank Square Spring Clean Day!! Register as a donor Online!